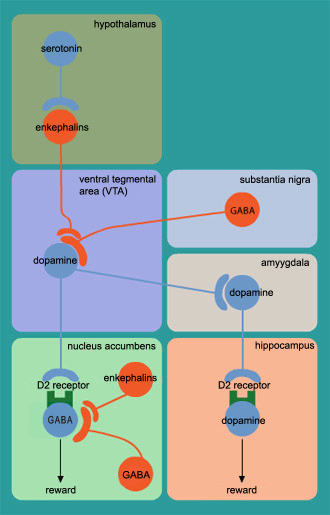 The VTA uses dopamine to modulate the activity of the nucleus accumbens, but other parts of the reward circuit also use other neurotransmitters, such as serotonin, endorphins, and GABA, to reinforce certain behaviours. There are several areas of the brain whose activation can have gratifying effects, but it is the stimulation of one particular pathway that produces the most intense pleasure. This is the medial forebrain bundle (MFB), which runs between the ventral tegmental area (VTA) and the lateral hypothalamus. It is inside this bundle that the nerve fibres of the reward circuit are located. The reward circuit is a sub-structure of the MFB, composed of the axons of the dopaminergic neurons that project from the VTA to the nucleus accumbens. The reward circuit (or MFB) also contains other connections (see diagram). Thus, the neurons of the VTA also connect to those of the amygdala, the septum, and the prefrontal cortex. The VTA’s connections to the prefrontal cortex show how the most primitive parts of the brain can still have a preponderant influence on our behaviours. Which can leave the neocortex with the embarrassing task of having to justify our behaviour in words! The MFB is not the only brain circuit that uses dopamine. It is one of the three major circuits that are at the source of our behaviours.